Good morning and welcome to the Independent's live blog on the debt crisis in Greece. Alexis Tsipras is preparing to push the bailout deal he agreed in Brussels on Monday through the Greek parliament in the face of massive opposition from his party. I am fully assuming my responsibilities, for mistakes and for oversights, and for the responsibility of signing a text that I do not believe in, but that I am obliged to implement. 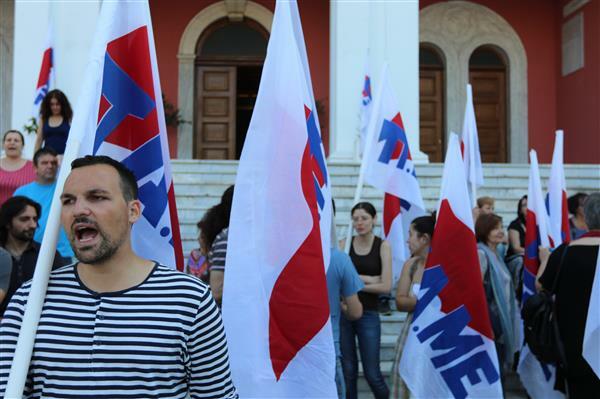 Up to 30 members of Syriza, led by party secretary Tasos Koronakis, are said to be opposing the deal. But there is little doubt that it will pass through parliament - Tsipras can rely on the support of his enemies in more centrist parties for that. Greek PM Alexis Tsipras must pass four key reforms through the Greek parliament on Wednesday to release a third bailout package that will save Greece from financial collapse. A 'secret' IMF paper, leaked yesterday, casts doubts on the very foundations of the deal struck in Brussels but advocating for debt relief. 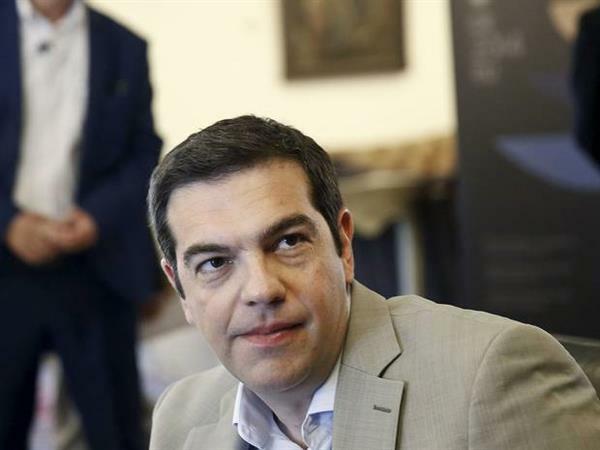 Alexis Tsipras, the Greek prime minister, has long advocated for debt relief. But the European lenders have so far resisted the idea. We had a report from the IMF a few days ago saying the debt was unsustainable. The three institutions, the troika, have brought Greece to this situation. From the last few months tsipras was saying the debt should be restructured. The partners say they do not want to discuss the debt. But we know that it is urgent that somebody takes of it. We have to remember that the IMF will be part of the measures and have to agree to the reforms. We see a split between the IMF and the EU. I hope the European people see what big games the European Commission has been playing, what lies they have been telling. These measures that we were blackmailed to take are not working - the same goes for the debt. All the countries of the EU are in debt. We must prepare measures to reconsider all of that debt. 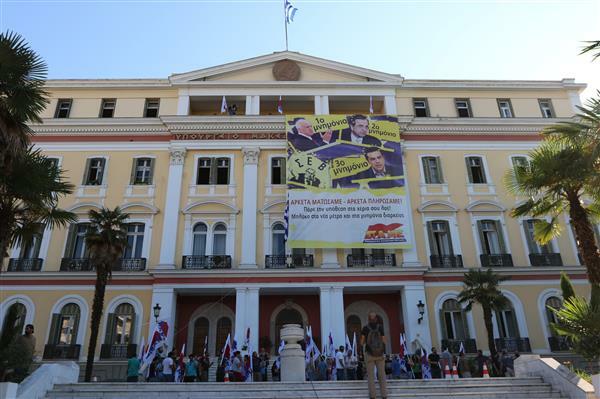 Protesters from the All Workers Militant Front (PAME) a communist trade group, have occupied the Ministry of Macedonia and Northern Greece, a government department based in Thessaloniki, in protest over the new austerity measures agreed on in the bailout. 10am (8am BST): debate on the Brussels bill in four consecutive parliamentary committees - Finance, Social Affairs, Production & Trade and Civil Service. 2pm (12noon BST): End debate, send vote to plenary so that it can be voted on by midnight. The European Commission has said it use a controversial European Union fund called the European Financial Stability Mechanism to lend Greece €7 billion in short-term financing, against the wishes of European nations that do not use the euro, such as the UK. A proposal leaked to Reuters said the loan would only be for three months, until a third bailout package from the eurozone is agreed. Sounds like #UK may be backing down on using EFSM for #Greece bridge financing if #eurozone provides some sort of collateral/guarantee. Here's a link to the proposals, which confirm that the EFSM funds would only be used for three months until a bailout was secured. Why? Because no one country offered to loan Greece enough cash to see it through. At presser, @VDombrovskis said nobody offered up bilateral loans to #Greece, forcing #EU to go to EFSM for bridge financing. David Cameron has said that there must be debt relief for Greece at Prime Minister's Questions. That aligns him with Greece and the IMF - though not with Germany. The principle that there must be debt relief is right. It is in the UK’s interest for the eurozone to resolve how it conducts itself. They need to resolve these issues, and quite fast. Yanis Varoufakis, the former Greek finance minister who sped out of government on a motorbike, has compared the new deal to a Versailles treaty. 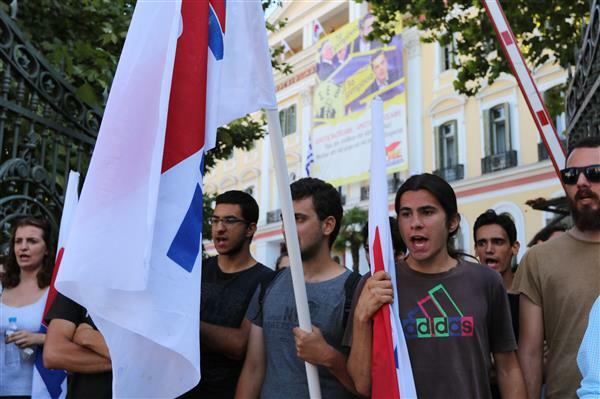 The majority of the Syriza party has signed a document condemning the Brussels agreement. 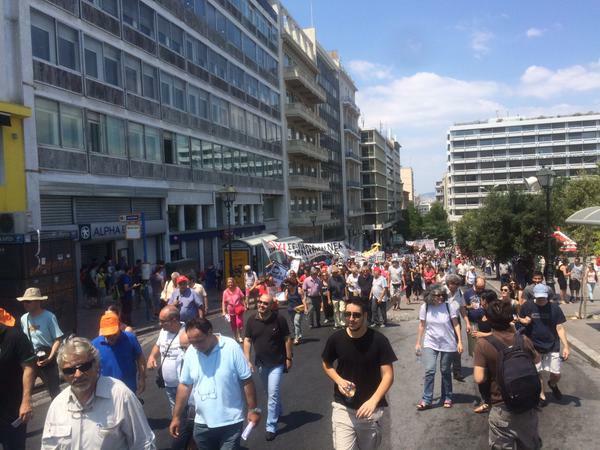 Of 201 Syriza central committee members, there are reports of between 107 and 113 standing against the deal. 107 out of 201 Syriza central committee members publish declaration condemning Tsipras' agreement with Eurozone. However: only 15 of these appear to be members of parliament. 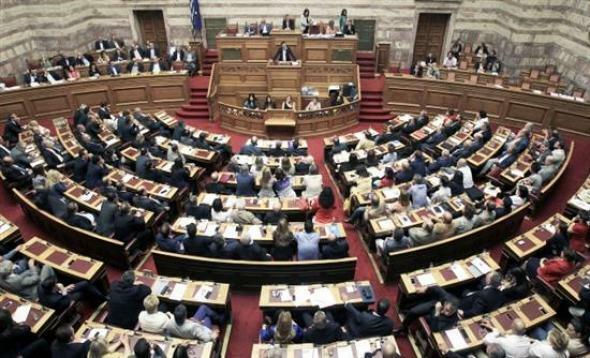 @GreekAnalyst Less than 15 from those 108 are members of the Parliament. Tsipras should have prepared/warned Syriza of a painful compromise soon enough. Now it may be too late. 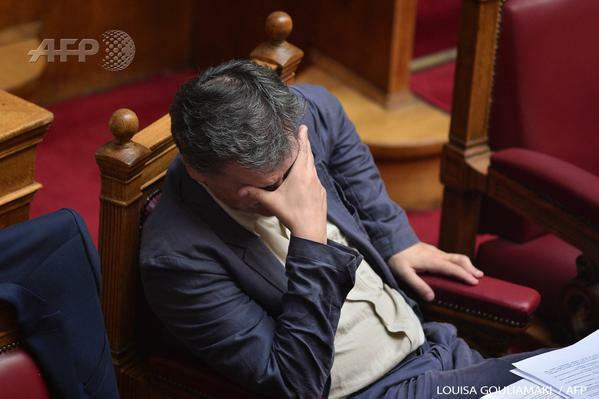 If too many #Syriza MPs vote against, things will get ugly. And not even the most extreme populism will save the party from what will come. My colleague Matt Dathan has some more information on David Cameron backing the IMF call for Greek debt relief. In Prime Minister's Questions, Cameron stressed the EU needs to come up with an idea for managing Greece's debt that is sustainable in the long-term. British taxpayers' money shouldn't be put on the line for a eurozone bailout.We're very clear about that and we're confident we can deliver that. However: the voting mechanism means that Cameron does not have the ability to block taxpayers' money going to Greece. Instead of giving all 28 countries the ability to block any measure they don't like, which would end up in deadlock on loads of issues, it means that measures can be approved even if only a proportion of the countries vote for it. It's called 'qualified majority' because it takes into consideration the population of each country when working how much sway they get in the vote. In some respects Cameron and Osborne have already backtracked on their commitment not to use UK funds. The UK Treasury approved the use of EFSM funds earlier as long as the UK is protected by guarantees. Foreign developments, in particular, pose some risks to U.S. growth. Most notably, although the recovery in the euro area appears to have gained a firmer footing, the situation in Greece remains difficult. And China continues to grapple with the challenges posed by high debt, weak property markets, and volatile financial conditions. 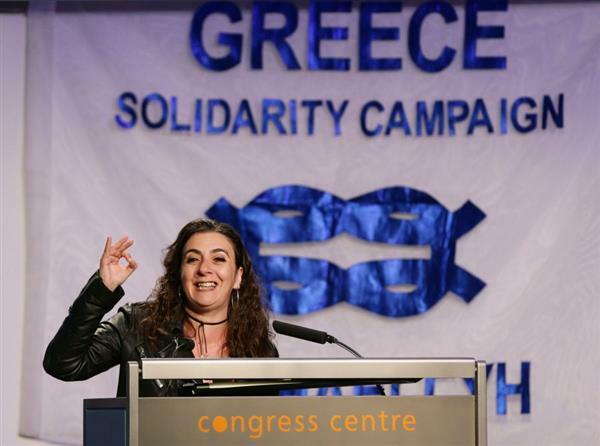 Nadia Valavani, deputy finance minister and key Tsipras ally, resigned on Monday, ahead of the vote. 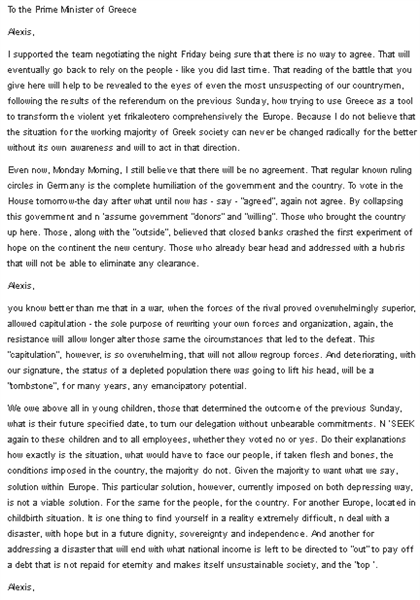 If the leaked letter below is to be believed, she said that Tsipras's capitulation to the creditors' demands is so extreme that it will not allow Syriza forces to regroup. 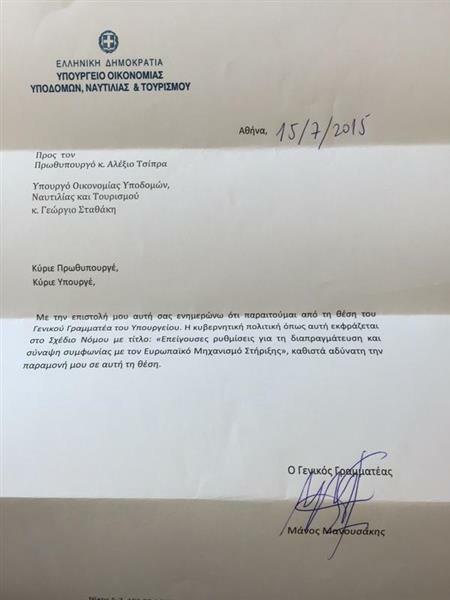 Another resignation letter, this one from Manos Manousakis, who is secretary general of the finance ministery - just in case your Greek is better than mine. 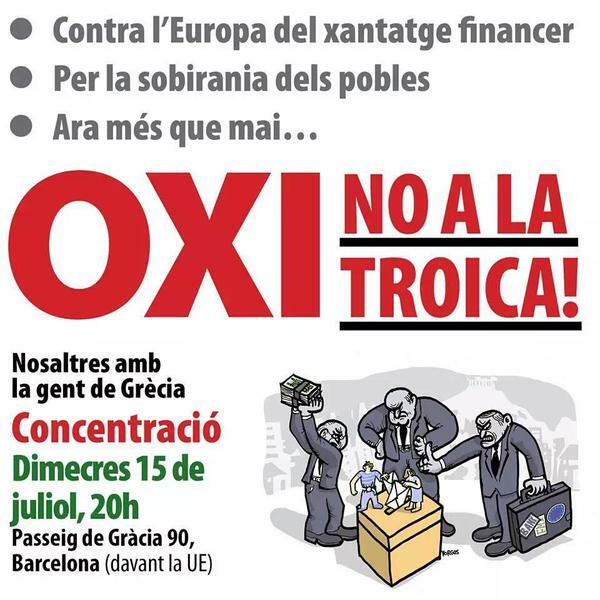 Solidarity protests are taking place in Barcelona this evening. 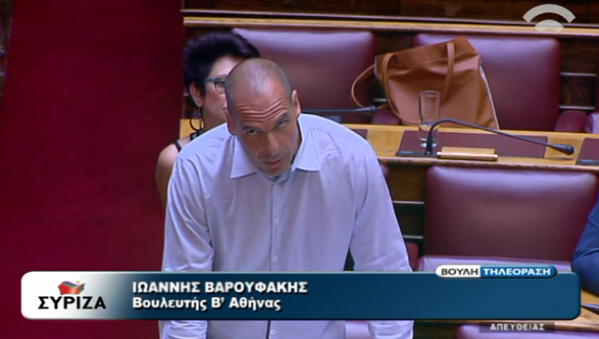 We won't hear the results of the Greek parliamentary vote until 10pm tonight. There's a Eurogroup teleconference at 10am on Thursday to judge whether Greece has passed the four measures needed to start bailout talks, plus the short-term financing needed to stop it going bust before the bailout is secured. Until then, some bedtime reading courtesy of Yanis Varoufakis, who has been working his socks off annotating the bailout deal that was agreed in Brussels on Monday. 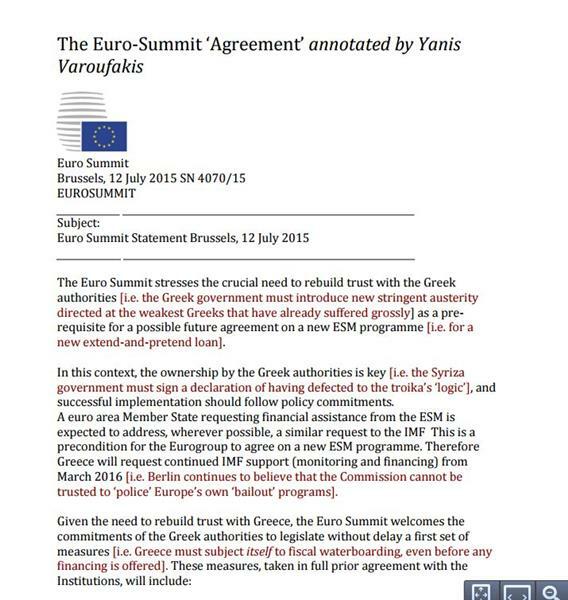 Yanis Varoufakis, the ex Greek finance minister, has annotated the Greek bailout deal. Thank you for tuning in - join us tomorrow to find out how the Greek government voted.